In 1944, the Japanese 15th army occupied Garrison Hill in Kohima, Nagaland. They used a cherry tree near by for sniper practice. What followed was one of the greatest wars ever fought. A small band of British and Indian troops besieged and outnumbered, halted the Japanese invasion of India. A branch grafted from this cherry tree now lies over the memorial commemorating the sacrifice of 917 brave Indians. Yet many Indians have never heard of ‘The Battle Under The Cherry Tree’. 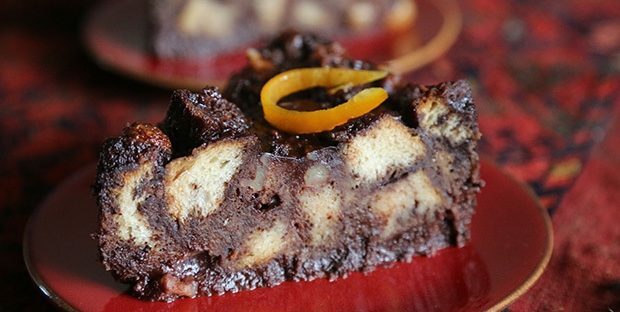 Cherries and chocolate are an irresistible combination. I make my bread pudding with the crust on. 1. Soak the cherries in alcohol for 2 hours or the previous night. Refrigerate in an airtight container or glass jar. 2. Remove from the refrigerator and reserve in a heatproof mixing bowl. 3. Toss the cubed bread in a large 12 inch round baking dish about 4 inches deep or adjust the size based on what you have in the kitchen. 4. Heat the milk, cream, sugar and cocoa in a large saucepan on low heat. 5. Stir constantly to prevent burning until the mixture begins to bubble. 6. Add the semi-sweet chocolate and switch off flame. Stir to melt the chocolate. 7. Rapidly whisk in the beaten eggs and vanilla. 8. Use a sieve and strain the chocolate egg mixture over the soaking cherries to remove egg bits. Stir well. 9. Pour over the cubed bread. Press down on the bread to ensure all the cubes are well soaked. 10. Cover and let the bread absorb some of the liquid for about 15 minutes. 11. Pre-heat your oven to 300 F. Prepare the middle rack. 12. Scatter the walnuts over the bread pudding and using a flat spoon stir them gently into the pudding. 13. 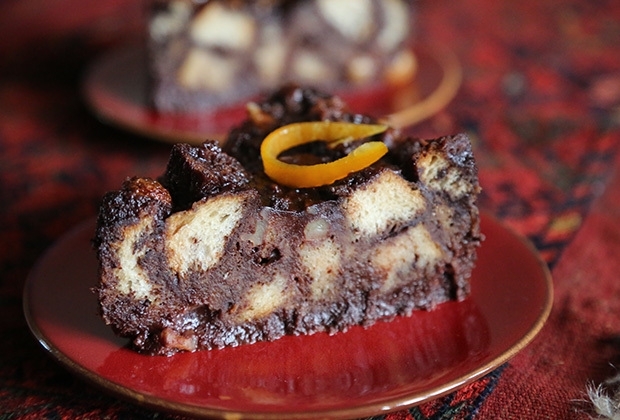 Cover with foil and bake 40 minutes. Remove foil and continue baking another 20 minutes until the custard is soft but set. The pudding shouldn’t ooze liquid. 14. I like the pudding as is, but you can serve it warm with whipped cream, crème anglaise or vanilla ice-cream. Figs are high in natural sugars, minerals and fibre. They are rich in minerals including potassium, calcium, magnesium and copper and antioxidant vitamins A, E and K that contribute to lowering the risk of osteoporosis and hypertension. Figs are a natural laxative and contain prebiotics, which help improve digestion. Figs are among the oldest fruits on earth and were so prized by the Greeks, they banned the export of this fruit. The fig is unique in botany because it among the only 'fruits' where the edible portion is the stem not the matured ovary. Turkey is the largest producer of figs. In India it is a minor crop and Poona figs are India's most popular. Recently a new variety called Dinkar in the Mangalore area has said to produce a better quality fig. Buy figs green or ripe purple but avoid figs that are marked or mushy. The season for fresh figs is between summer and Fall but in India it is even shorter with limited supply in May, November and December. Figs have a short shelf life, in warm weather keep them refrigerated when fresh and wash only when you are ready to eat. Dried figs will keep for much longer but are also best refrigerated in warm weather. Figs, unless raw, are seldom peeled. Figs pair well with red wine, honey, nuts, apples, spices like cinnamon, paprika, soft cheeses like ricotta and blue cheese and are delicious is salads, as jams and chutneys, in cakes and puddings. Combine wine or orange juice, honey and spices in 9-10 inch wide and 3-4 inch deep saucepan. Place figs in an upright position in the liquid. Cover with a piece of wax or parchment paper. Press down gently on the paper to ensure the figs are all submerged in liquid. Cook on a slow flame about 30-35 minutes until figs are soft and tender. Remove wax paper. Using a slotted spoon remove figs from the hot liquid and place in a bowl. Let the liquid continue to cook until it forms a thick and sticky but pourable syrup. 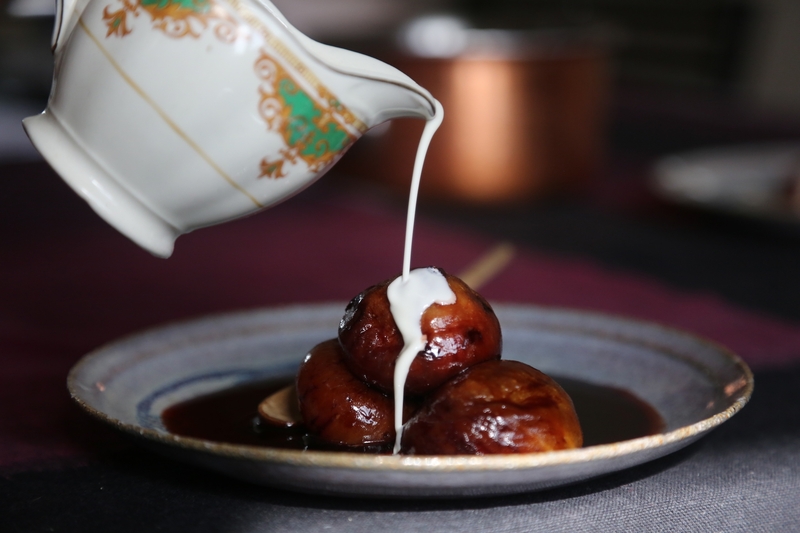 Remove the cloves and the cinnamon and pour the sticky syrup over the figs. Serve warm figs with cream or crème anglaise and if you are vegan as is or with a vanilla sorbet. 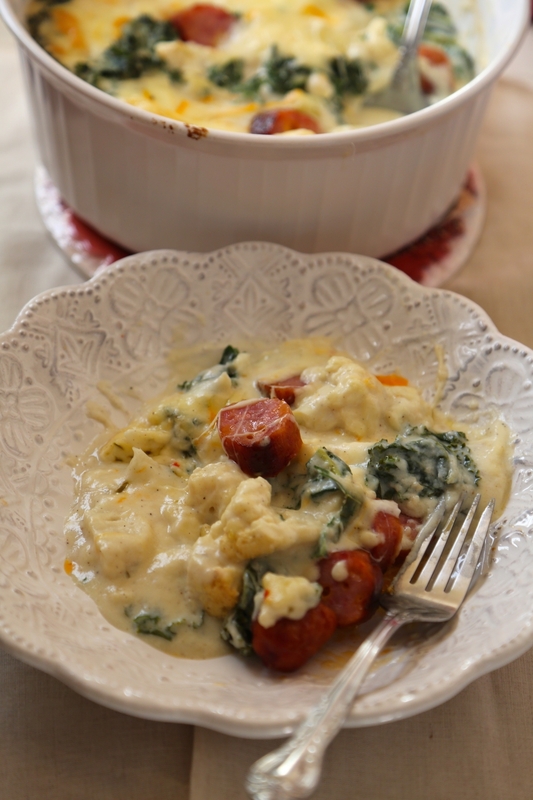 This is a dish of leftover vegetable, cheese and greens. You can substitute the kale with chard, radicchio even spinach, the cauliflower with broccoli and use various leftover pastas for the dish. I used a vegan sausage. Preheat oven to 350C. prepare middle rack. Heat the butter or olive oil and saute the flour on a medium flame about 2 minutes. Add the milk, cauliflower and a teaspoon of black pepper and hot sauce. Cook 2-3 minutes. Switch off flame. Stir in a cup of room temperature water. Add finely chopped kale or greens of your choice, the pasta and stir well. Sprinkle the cheese over the top and stir gently into casserole. Taste for salt and adjust. Bake for 35-40 minutes until cauliflower and pasta is done. Serve hot with crusty bread. 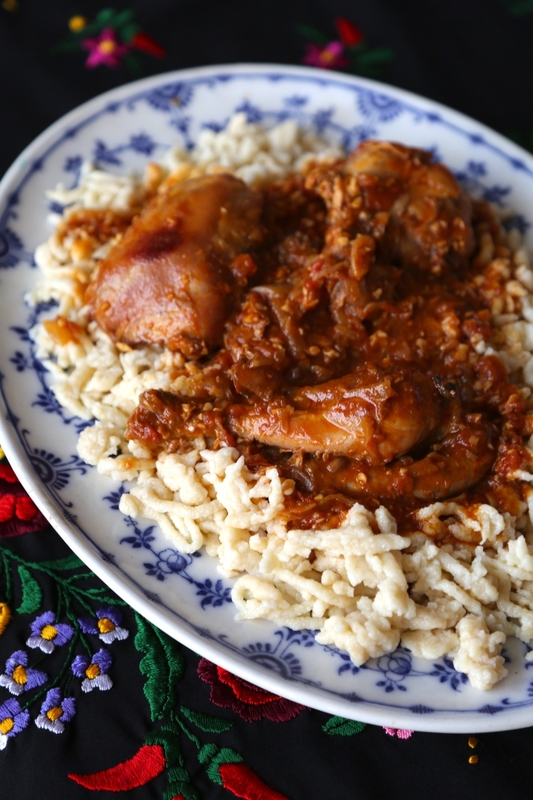 This chicken dish is a Hungarian classic. 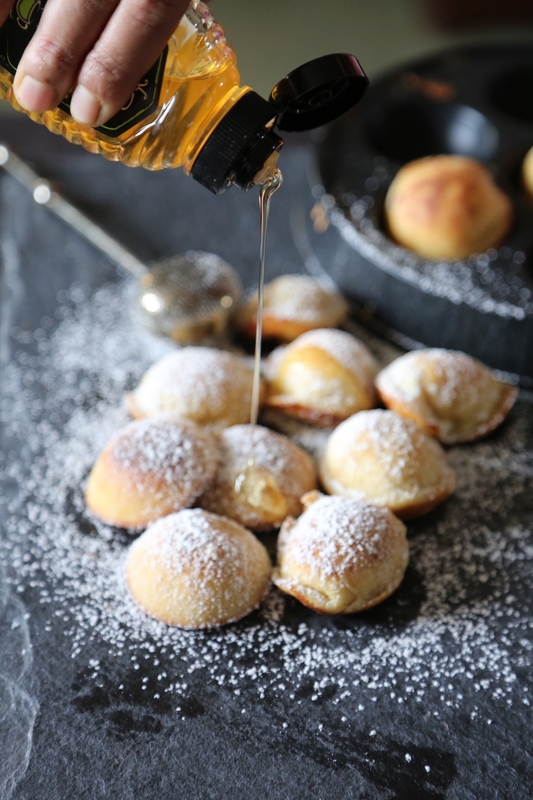 Serve it with Nokledi or Spaetzle, a home-made flour dumpling or just plain boiled potatoes. You can buy a special tool for making Nokledi but in India I used the large setting of a brass chakli and sev maker. 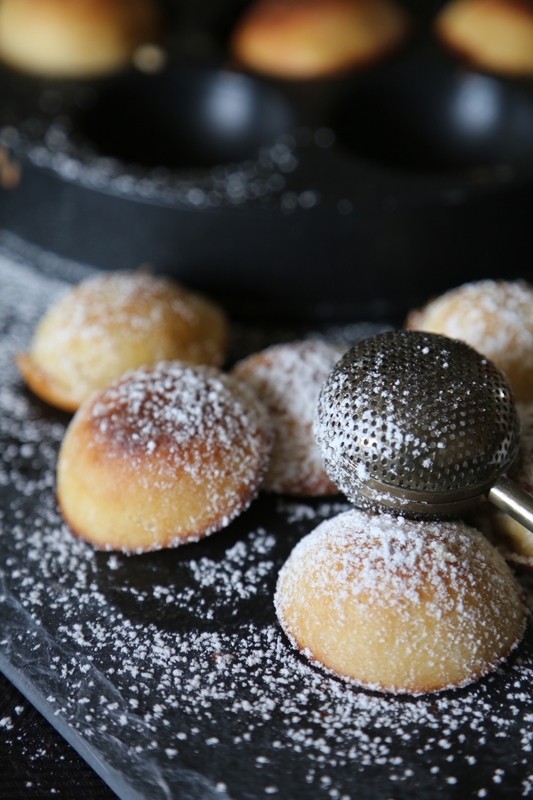 You can also use a sieve with large holes and just pass the batter through it. Sprinkle the chicken evenly with 1 teaspoon salt and pepper each. Heat a large heavy bottomed pot over medium-high heat and add the butter and olive oil. When its melted lay down all the pieces of chicken and deeply brown the skin evenly on all sides. This should take 7-8 minutes. Lift the chicken out of the pan onto a plate using tongs. Add the onions to the fat remaining in the cooking pan and cook until soft but not brown. Add bell peppers. Saute until tender and falling apart. Add garlic and saute 2 minutes. Add tomatoes and tomato paste and cook another 3-4 minutes. Add the paprika and continue to cook until tomatoes are pulpy. Stir from time to time to prevent burning. Return the chicken to the pan and toss to coat all the pieces. Lower flame and stir in the chicken stock. Cook on a slow flame until chicken is done. Set a large pot of water with 1/2 teaspoon salt to boil on a high flame. Combine all the ingredients for the spaetzle in a mixing bowl and stir well. The batter should be thicker than a pancake batter. Set sev or chakli maker with the largest perforated disc. Pour batter into the chakli maker. When the water is boiling hold the sev maker or sieve over the pot and turn the handle in circular motions to pass the dough through the perforations into the boiling water. Work fast and get all the batter in the sev maker out in one go. This cooks for less than 30 seconds so using a perforated ladle quickly spoon out the cooked noodles (they will resemble little nuggets) into a bowl. If you plan on using them later dunk them in cold water. If you are using a sieve press the batter through it using a large round spoon. To serve ladle a portion of the hot Chicken Paprikash over the dumplings, noodles or potatoes. top with a generous dollop of sour cream or unsweetened, fresh strained yogurt. This is a mocktail made with raw ingredients and no added sugar. 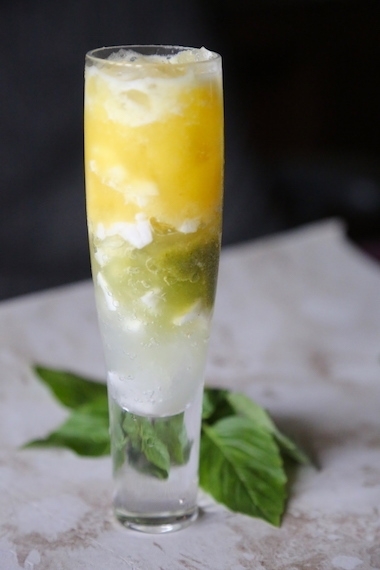 The combination of basil and mango is refreshing and the colors pleasing to the eye. Freeze the mango juice into small ice cubes that will fit your glasses by pouring them into an ice tray- about 6-8 small ice cubes. Pour the chilled tender coconut water into 2 tall or high ball type glasses in equal measure. Top with the tender coconut. Divide the basil puree between the two glasses. Top with mango ice cubes. Serve with a tall spoon or swizzle stick if desired or as is. 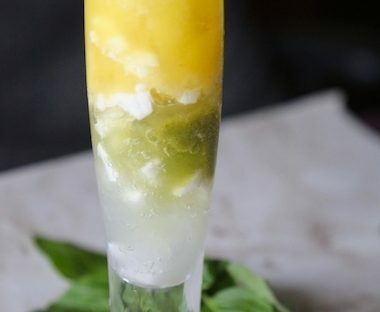 The mango ice cubes will help keep the drink cooler for a longer time and as they melt the flavors will mingle with the basil and coconut.